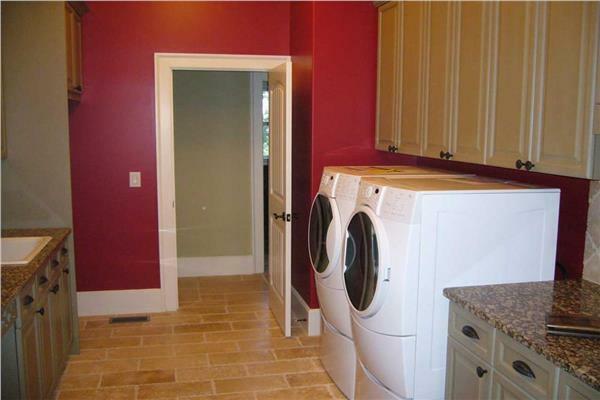 Having a dedicated laundry room in a home is one of the greatest luxuries for anyone with a family, especially when the room is conveniently located. Laundry room on main level house plans eliminate the inconvenience of having to run up and down basement stairs (where the washer and dryer are often located) to wash clothes by placing the facilities on the ground floor. While meals are being prepared, it is quite easy to wash and dry a load of laundry if the machines are near the kitchen. This type of house plan is a great choice for busy families with a lot of kids, as it reduces the amount of time spent going between floors to collect clothing and use the machines. The kids just bring their clothes to the central location when they come down on the morning of wash day. It’s also more convenient for parents with smaller children, as they no longer need to bring the kids up and down the basement stairs so they can keep an eye on the youngsters. Some house plans with the washer and dryer on the main level provide an uninterrupted line of sight straight to the living room or kitchen, so children can stay within sight at all times. These home plans are also perfect for older couples with a master bedroom on the main floor whose children have left for college or to start their own families. They allow the owners to skip the trouble of going up and down stairs with heavy laundry, which can be very difficult for anyone with joint pain. Some plans may also combine the laundry room with a mud room or a back porch, typically placing the laundry room near the kitchen or at the rear of the home. Make your life easier by looking through some of these house plans where the laundry room is conveniently located on the main level.